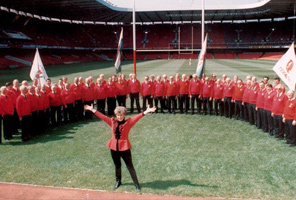 Success and enjoyment in the 1983 tour had been so great that back home at the ‘winding-up’ meeting, no fewer than 153 choristers (the number present!) 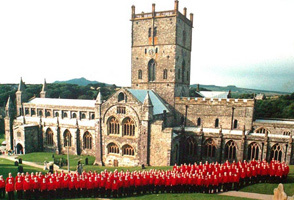 unanimously voted to continue; the ‘raison d’etre’ being to continue to take abroad the traditions of the Welsh Male Choir. To date, 22 tours have taken place – USA (4), Canada (3), France, Gibraltar, Eastern Europe, Australia, together with no fewer than seven Commemorative Tours to the WWI and WWII Battlefields of Flanders and Normandy performing often before Royalty, Government Leaders and most importantly Veterans. The choir has even travelled to Monaco for a one-off concert in the International Sporting Club, and cruised the Baltic with shore based concerts in Russia, Estonia, and Norway – we have just returned from Belgium and appropriately Germany this year. 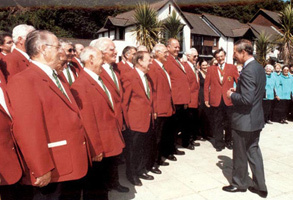 Over the years The South Wales Male Choir has been hugely fortunate to have secured the services of many esteemed conductors and accompanists. 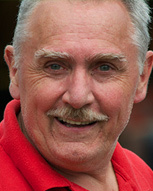 The choir’s first conductor, Alun John, was followed by John Samuels and Alec Brooks. 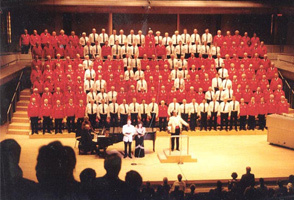 In 1999, a major change to the choir’s appearance on stage came with the appointment of Haydn James, who demanded that choristers must no longer use music copies during performances! 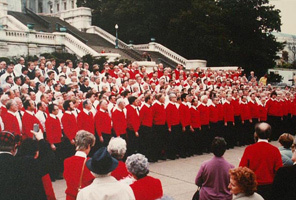 This crucial change allowed for the quality of the singing to reach an even higher standard, and for the audience to feel a stronger connection to the choir. D Eifion Thomas further enhanced Haydn’s progress to the point that when the first lady Musical Director of SWMC, Elaine Robins took over, the choristers were enjoying their music more and more. Competition success came about under Elaine’s guidance and amazingly, piano accompaniment has remained through the choir’s history with a Ferndale ‘Davies’ (originally the late Bryan Davies, and since 1993 with daughter, Siân Davies). Ladies continue to add to the SWMC tradition, not just on the stage, but behind the scenes as well. 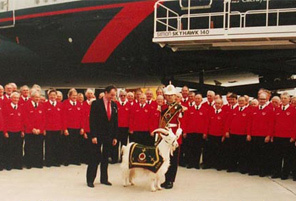 The ‘Ladies Support Group’ raise thousands of pounds every year, adorn auditoriums in their traditional Welsh Costumes, sell CD’s and memorabilia and are very much part of the SWMC ‘family’. The choir is also very proud to have its own supporters club. The ‘Friends of SWMC’ now number in excess of 96 individuals and virtually every concert sees a new name joining our group of Friends! The South Wales Male Choir’s ethos can be summed up by its original piano accompanist Bryan Davies, who said, “Music is a serious business, but it’s got to be fun”. Three loud ‘Amens’ to that! November ’83 USA – Pittsburgh, Baltimore, Washington, New York, Buffalo. October ’91 FRANCE – Chartres Cathedral, Notre Dame Cathedral Paris. October ’97 USA/MEXICO – Los Angeles, Encinitas (Cardiff BTS), San Diego, Tijuana, Coronado Is. 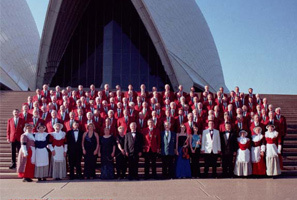 September ’02 AUSTRALIA – Ipswich, Brisbane, Sydney Town Hall, Orange, Canberra Flower Show and Great Hall of the Parliament, Newcastle, Sydney Opera House. March ’04 USA – Atlanta, Savannah, Macon Cherry Blossom Festival. August ’05 HUNGARY/CZECH REPUBLIC/POLAND – Budapest, Prague, Krakov,Oswiecim. August ’08 CANADA – Halifax, Luneburg, Fredrickton, Quebec. 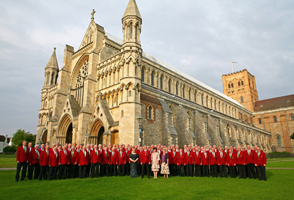 August ’11 BALTIC CRUISE – SS Balmoral Concerts, Tallin, St. Petersburg, Kristiansand. August ’14 FLANDERS/FRANCE – Poperinge, Amiens, Arras, Boezinge, Ypres, Paris (Disneyland). August ’16 NORWEGIAN FJORDS – SS Black Watch Concerts, Flåm, Olden and Bergen. August ’18 BELGIUM / GERMANY – Bruges, Ghent, Rüdesheim, Bacharach, Koblenz.